The BLU Vivo One Plus, for obvious reasons, is a plus-sized version of the Vivo One that comes with several upgrades in terms of technical pros and cons. Despite its refinements, however, this Plus edition's weak points still render it a moderately-specked phablet, especially when pitted against the best phablets as of this technical review. Among its biggest cons are low-caliber hardware components, namely, a 1.3GHz quad-core MediaTek 6739 processor and no more than 2GB of RAM , both of which were lifted straight from the plain Vivo One's playbook. It also brings back its base model's IMG GE8100 graphic processor that's rather unsurprising, given its aforementioned entry-level processor and modest RAM count. Despite having practically the same hardware setup as the plain version, however, the Vivo One Plus likely edges out its sibling in terms of endurance, lugging what BLU calls a 4000mAh monster battery inside its chamfered-edge aluminum housing . 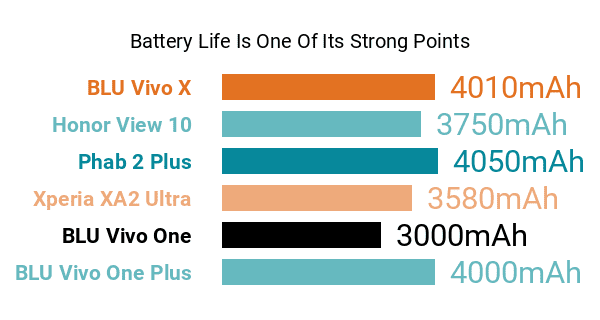 Sure, many of the best big-battery smartphones bluster with roughly 5000mAh of power, but compared to the Vivo One's 3000mAh capacity, it's right on the money. A couple more of its key improvements over the Vivo One come in the form of upgraded rear and front cameras. 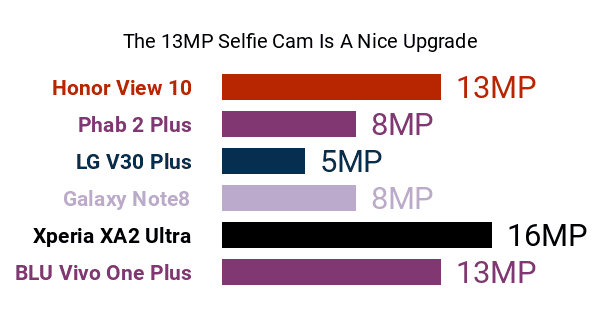 While the Vivo One dedicates a middling 8-megapixel front-facing camera for selfies, the Vivo One Plus now comes with a 13-megapixel LED-flashed-equipped selfie cam -- an outright pro, coming from a phone with its kind of hardware, not to mention that the best selfie phones often come with front-firing LED lights as well. Additionally, it replaces the Vivo One's 12-megapixel dual-flash primary camera with a 13-megapixel shooter that retains its dual-LED flash setup . Up front, the Vivo One Plus touts a large 6-inch display with a trendy (as we were exploring its pros and cons) 18:9 aspect ratio -- the conventional aspect ratio for smartphone displays when it came out was 16:9. However, its expansive facade is tainted by a disappointing (by 2018 standards) 1440 x 720 HD+ resolution and, consequently, a sub-standard 269ppi pixel density score . 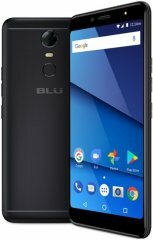 Fortunately, BLU did not forget to rig it with a standard fingerprint reader combined with an encrypted file management system for added security . It could have done better than 16GB of internal memory , though, but this storage cap does not surprise us, given the rest of its specs. Long story short, BLU's Vivo One Plus is a wide-screen Android for power-cautious binge-watchers who are shopping on a rather tight budget.